Open the package of dough and separate the individual biscuits. Lightly grease the waffle iron, and set 1 or 2 biscuits in the iron (depending on the size of your iron). Cook for 2 minutes or until golden brown. Remove and set on a rack to cool. Assemble the sandwiches: start with a layer of greens, add the turkey, mashed squash or sweet potato, and finish with cranberry sauce. Add the top waffle to complete the sandwich and serve immediately. To give these sandwiches extra fresh flavor, add more veggies such as tomato or avocado. Not sure to do with all those leftovers? Don’t worry! We have the answer. 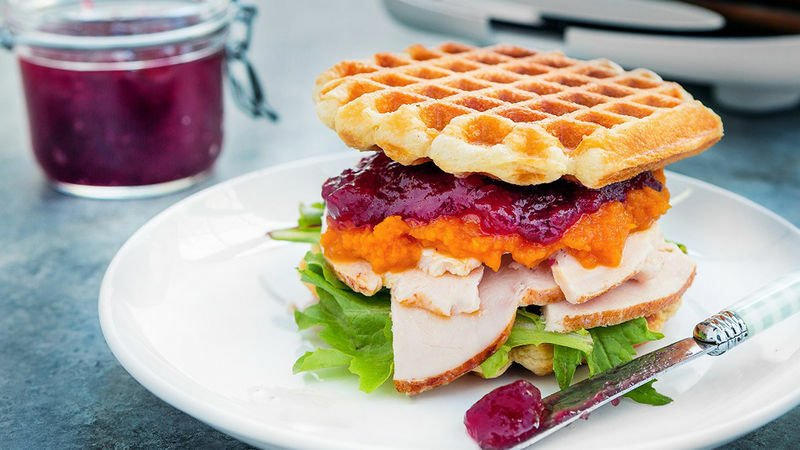 These waffle sandwiches are delicious and a perfect way to take advantage of tasty Turkey Day foods. I personally like to combine all the Thanksgiving dinner leftovers in one dish to make the most of each holiday ingredient and to bring thing together in one different and creative presentation. I assure you your family will be pleasantly surprised with this original sandwich idea. Enjoy!